Spectacular lifts are a big part of synchonized swimming. After synchronized swimming was hilariously mocked in a "Saturday Night Live" skit from the 1980s -- comedians Martin Short and Harry Shearer flailed in the water, bounced off the bottom of the pool and could barely swim in their pseudo-attempt to bring synchronized swimming for men into the Olympics -- the sport finally is getting its due. Underwater cameras at the 2012 London Olympics made it possible for the audience to grasp the unique difficulty and athleticism the event requires -- it has been described as a combination of speed swimming, gymnastics and dance. A surge in interest followed, encompassing everyone from girls to masters competitors to synchronized classes for the masses. As iSports explains, you need strength, speed and artistry to excel at the sport, and workouts are accordingly grueling. "CBS News" reported that Olympic training camps put athletes through eight to 10 hours per day workouts, with only one day off per week. That's understandable when you realize an athlete has to hold her breath for up to two minutes underwater to make it as a competitive synchronized swimmer. U.S. Synchronized Swimming membership director Stephanie Crocker says the sport is "like running a four-minute mile while holding your breath for half of it." While that's an exaggeration, you have to be incredibly fit to make it big in the sport. So you will literally swim thousands of miles in the pool to build up your endurance. Plyometric exercises, which center around movements to build explosive strength, are a prime part of workouts for synchronized swimming. Elite synchronized swimmers might spend several days a week hopping, jumping and bounding to develop the explosive strength that plyometrics develops. In addition, plyometrics works without building bulky muscles that might take away from the sleek-limbed artistry demanded by the judges. Stanford University coach Don Chu puts Olympic-caliber synchronized swimmers through 50 or 60 plyometric exercises in a single session. 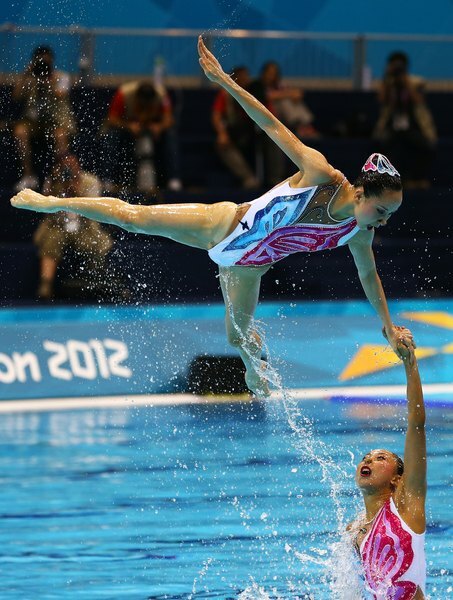 Since synchronized swimmers are often lifted and thrown, they must develop the skills and grace of a gymnast. 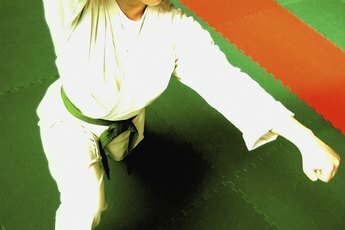 Static and dynamic stretching are used to increase flexibility. Gymnastics classes enable the swimmers to get used to flying through the air -- which is considered safer -- before they do the same maneuvers in the pool and hit the water over and over again. 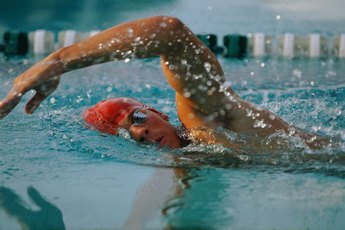 In addition, swimmers spend time doing "land drills," rehearsing their routines by using their hands instead of their legs. The goal is to give swimmers a bit of muscle memory that can be called upon when they perform their routines in the water. Swimmers who compete in the duet and team competitions spend lots of time coordinating their routines. Anna Kozlova, who fled from Russia to America and won bronze medals in the duet and team events for the U.S. at the 2004 Athens Olympics, says that the hours spent honing the routines is essential. "What makes synchronized swimming unique is that it has to be exactly synchronized," Kozlova told "USA Today Education." A split-second lapse in synchronization between teammates can mean the difference between winning and losing.